We’re in your neighborhood and we’ll fix it, no matter where you bought it. Call 1-888-391-8867 to find a Repair Center near you. We’ll diagnose, explain the issue, and repair it fast. Looking for DVD player repair or portable DVD player repair? Sears Home Services can help. We’re your best, most-trusted option for fast, quick, and easy local service, repair, and maintenance of your DVD player and portable DVD player. Whether you’ve got a stuck disc in your DVD player or your DVD player just isn’t working, we’ll connect you to the best local DVD player service technicians in the business. Technicians that are highly trained, licensed, vetted, nearby, and guaranteed to help fix all of your DVD player needs. We have thousands of local technicians that are always “near me,” that can help you no matter what your appliance emergency. 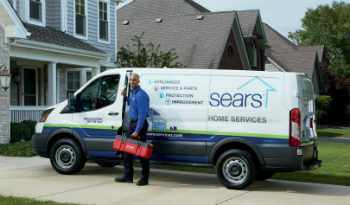 Did you know Sears Home Services fixes most major appliances, including refrigerators, televisions, and HVAC systems? See everything we repair. We currently have multiple openings for Appliance Service Technicians in locations across the country. If you have the skills to repair Washers, Dryers, Ovens, Dishwashers, Refrigerators or HVAC equipment, we’d like to talk with you.